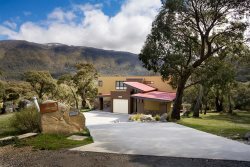 Kooringa 5 is a 3 bedroom Jindabyne Accommodation unit for 6 guests. Kooringa 5 - A 3 bedroom / 2 bathroom renovated unit with the Lake so close you can almost touch it! Move a little and see the main range stretched out above the lake. The unit has floor to ceiling windows in lounge and bedrooms which bring the mountain and lake views inside and create a wonderful panorama of the Snowy Mountains. Master bedroom offers an ensuite and the second has a set of bunks with the third a double. Superior white crisp linen and extra large towels are provided. The compact open plan living area comprises a renovated and equipped kitchen with dishwasher and a living area featuring digital TV. The large laundry offers plenty of storage and is heated to ensure all of your snow gear is warm and dry for the next day on the slopes or bring a bike for the mountain biking trails around Jindabyne. You can also order 5gb of Telstra 4G Mobile Broadband Wi Fi with your reservation at this property. Undercover parking ensues no frosty windscreens. The location allows the ease of a short walk to the town center and your choice of restaurants, hotels and club. Bedroom 3 - Bunk Bed ( 2 ) Upper bunk suitable for kids only. The best staff always helpful! Another great stay. A little dated but still functional. Heating was warm. Check-in details were well-communicated, especially the tip with the Right of Way access. As a result no one was lost trying to find the property. Check-out was quick and smooth, leaving us more time to spend on the snow which is what we came for. Overall, hard to fault the team for anything. Greatly enjoyed our stay and would be happy to stay there again. Check in was smooth even though we arrived super late from a long drive.We really enjoyed our stay and look forward to our next visit to Jindabyne! Great apartment with an amazing view from the balcony. Stays warm (we visited in winter) and everything works, which is all you need for a great ski weekend. Had a great stay! Thanks! We had a great time here! Peter and his crew were very friendly and helpful.We had a little issue with the door of one of the bedrooms and Peter was there within 10 mins to help us out which was great! Loved the view, location of the apartment and how it was set up. The kitchenware was a bit outdated but everything worked well and was functioning well. We shared with another family and plenty of space for the parents and 2 kids. On arrival the whole place was nice and warm and we felt comfortable immediately. Beds, bedrooms and bathrooms all clean and comfortable too. Would definitely recommend and if we ever go again we'll be back! Thanks for the stay Peter and Joan! We really appreciate the service and flexibility of check ins/check outs. Back next year hopefully! Our stay at Kooringa was vey enjoyable, with lake views, decent amount of space for 3 couples and an awesome location, being walking distance to the shops and restaurants this is a great value stay for a ski trip or holiday! Checking in and out was flexible and not too complicated. Highly recommend this property and Ray White Jindabyne. Perfect place for our trip to Jindabyne for the L'etape, wonderful views of the Lake. Very helpful, always happy staff. Available to help at all times. Great views, great location, very cosy with great heating, loved the short weekend we stayed. I found all members of your team to be professional, friendly and helpful! The property was better than we expected. We found the dining table and chairs a bit difficult (they were so large).